Live Clean Aromatherapy Foam Baths are packed with plant derived moisturizers and infused with vitamins and antioxidants. Featuring certified organic Chamomile, Ylang Ylang, and Jasmin, scents rich in aromatherapy properties to create a calming, sensory escape. Certified organic botanicals of Lavender and Vanilla create a soothing aromatic experience that helps calm and reduce stress. We really love this and I feel good letting my kids use it! Really love this product...smells fantastic. My kids love it too. Would recommend. Really happy with this product, as with other products from this brand. The bubbles last very well! 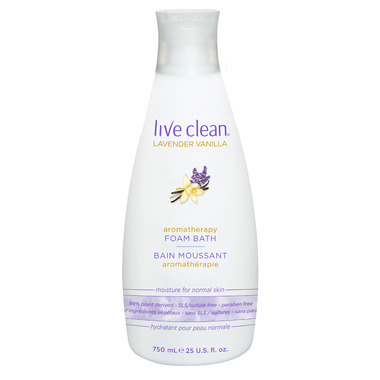 I've just recently started using Live Clean products and this foaming bath is wonderful. The smell is nice and the bubbles last a long time even in our hard water. It doesn't irritate my skin which is very sensitive. I will be buying this again. This is a nice bubble bath! It soaps up well and doesn't irritate my sensitive skin! Smells great although it is more lavender than vanilla. Wonderful like all the Live Clean products. A lovely scent, great bubbles, from a brand I trust. A great way to start a bedtime routine. The scent is very lovely and calming. More lavender than vanilla, which I appreciated. Bubbles get pretty big for a natural product! My kids love a little soak in this every once and awhile. Nice bubbles, seem to last quite a while too. I thought the sent would be more vanilla, still getting used to it, but it does make my skin feel nice after a bath. Nice bubble bath. The scent is light and calming, and it's gentle/ moisturizing on the skin.